The wooden barn and tractor play set. You can smell the fresh-cut hay in this staple of childhood play that will inspire hours of creative fun. 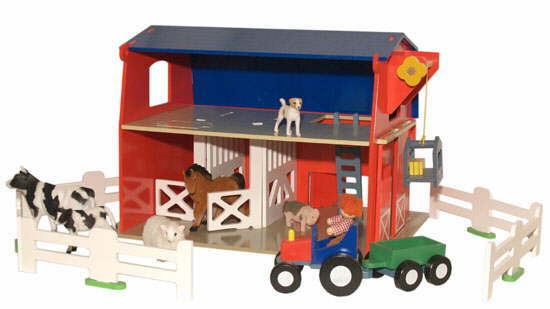 This deluxe playset features 2 horse stalls, a hay elevator, 2 functional sets of barn doors, a roof that flips up for hayloft access, 6 realistic barnyard animals, a ladder and 2 hay bales. Comes with Tractor and accessories includes tractor, driver, pitchfork, 2 hay bales, and 5 fence segments.